As an adult, one of the most meaningful and rewarding experiences is when you buy your first home. Its a place of lasting memories when building a family, celebrating a holiday and growing comfortable in your surroundings. Its also a key to todays financial portfolio. In a sense, the purchase of a home is the gateway to the good life that lies ahead. This is the foundation of Gateway Realtors at 464 Boulevard in Hasbrouck Heights. 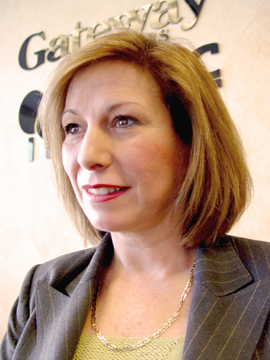 Gateway Realtors, one of the leaders in the real estate community of Bergen County, was founded in 1983 by Martin and Mary Ellen Courtney of Hasbrouck Heights. The name "Gateway" comes from the original location of the business. It stood on the borders of Hasbrouck Heights, Lodi and Hackensack. Now its location stands as the first commercial building as you enter Hasbrouck Heights from Hackensack. While Martin grew up in Maywood and is a Bogota High School graduate, Mary Ellen Courtney (nee Pagliei) grew up in Hasbrouck Heights. Her father, Rico "Henry" Pagliei, grew up in Hasbrouck Heights, was an alumnus of Hasbrouck Heights High School and served as our councilman for nine years back in the 60s. Her mother, Susan, grew up in Passaic. Mary Ellen remembers, "My sister, Susan, worked in Spindlers Bakery; so did my cousin Carol Ann. I too wanted to earn my own money. The day I was able to get my working papers I was hired at the Hasbrouck Heights Shop Rite. All of my siblings worked "in town" when they came of age. Vinnie and Rico were also at Shop Rite and Dean washed the school buses that were stored at Villa Exxon which is my office today! During the summertime, at the playground behind Lincoln School, I must have made over 100 potholders and key chains. The 4th of July Childrens Parade was a favorite of mine. I dressed up my brothers and their friends (Jack and Jill, The Girls from Auntie). Another favorite was the bike marathon. My friends and I baked cookies for the guys who camped out at "the race." So glad that they are doing this again. What great memories! In winter when the snow fell and we would imagine taking all of the snow from our homes and piling it at Mrs. Mohairs house (she was the superintendent of schools) (Ed. note: Now the Central Avenue parking lot across from the Senior Center) so she would look out her window, think there was a blizzard, and call off school. We would listen for the horns to blow to signal school was cancelled. When it was very cold we would look for "The Flag" with the big red circle on it flying on the High School flag pole. It was our cue to get our ice skates on and head for the tennis court / ice rink behind the high school. As a teen, hanging at "The Center" (CYO Center) was one of my favorite past times. Painting backdrops for plays, rehearsing all summer long for our big performance, was so much fun. I can still remember the time I had to baby-sit for my brothers Rico and Dean, and although Rico said he didnt feel well I brought him along; it turns out he had chicken pox. I hope I didnt cause an epidemic  but back then I didnt care. Wednesday nights we had Canteens at the CYO Center. I was the "social director" with the job of being a band scout. I would go listen to them play  if they were good and willing to work for half the door proceeds - they were hired. These summertime Wednesday night events were the highlight of the week for many of us teenagers. I also remember a fabric and pattern store on the Boulevard. I enjoyed sewing my own clothes and making costumes, so this store was very handy." Mary Ellen, her sister and three brothers are all Hasbrouck Heights High School alumni. She grew up on Central Avenue surrounded by family, many of whom still live in town. "Memories and recollections act as the gems that we pass on to our children; they are our silent smiles as we sit and remember our past, they shape us and motivate us, maybe subconsciously, to create our own personal set of values that are a part of who we eventually become. The memories and experiences I recall of growing up in Hasbrouck Heights greatly influence me to this very day. When I see the orange blockade on Central Avenue near the Boulevard I think of when I grew up on the 200 block of Central Avenue. I remember my family home and my neighbors and I know that just a few of these families are still there. As children we drew chalk houses on the street pavement and laughed when the cars rode over all of our specially designed rooms. The Central Avenue block parties, camping out in neighborhood back yards, lemonade stands, back yard bocci tournaments, and Mrs. Mohairs demolished house are just memories now - but great ones. Walking up to Ziffs Pharmacy, Henrys Deli or the corner candy store to run an errand for Mom always resulted in a nickel or dime to spend in town at one of my favorite spots -- Trash and Treasures (a penny candy store on the corner Terrace and Washington Place), or the store we called "Pops," (a five and dime on the Boulevard). Small change could buy a lot back then. My friends and I would go from door to door in our neighborhood to scavenge for bottles that we could return to Bennys Market for the deposit money. I truly cant remember the womans name but she always gave us her "returns" with the stipulation that we pick up some cat food for her while we were there. Away we went pulling a wagon full of bottles. We worked hard to earn some spare change. I sold flower seeds, magazines, Stanley products and many more items  all before the age of 12  way before I could earn baby-sitting money. I enjoyed doing errands for my Mom, walking to the Milk Jug for milk or ice cream or to "The Italian Store" (I cant remember its name anymore) for fresh grated Locatelli Romano cheese. The adventure gave me an opportunity to see the world. When I was 9 or 10 years old at Christmastime, I would spend all of my savings buying presents for my family. A $1.00 brooch  purchased at Pops for Grandmom Pagliei was an extravagance to me. I could not wait to see her smile and see her wear it. Mom and Dad got a clock for a few bucks that I purchased at a local vendor. A Matchbox car for my brothers and some Coco Frapie lipstick for sister Susan -- all purchased in-town -- and this made me proud." On top of her responsibilities of helping run and grow a business, Mary Ellen also serves as the Second Vice-President of the Hasbrouck Heights Chamber of Commerce. "As a business owner, its good to be involved. We are trying to address the parking problem we have in town as well as working with the Beautification Committee to spruce up downtown," Mary Ellen said. "Weve started with decorative benches along the downtown corridor and planting flowers near the trees. We are also trying to build up the annual Farmers Market. We are approaching new business owners about joining the Chamber, so that we can strengthen our focus on the downtown area. In my business I see the importance of a strong downtown shopping area and the value of local businesses for a community. People want this advantage. Hasbrouck Heights is fortunate to be one of the few towns with this amenity. The Boulevard has been changing, just a handful of the old-time stores I remember remain. But change is good, its part of our evolution. I hope people see our conversion of the closed down Villa Exxon to Gateway Realtors as a positive improvement. Hopefully, our downtown is creating happy memories for the people of Hasbrouck Heights today. The safety and convenience of local shopping not only is a great amenity, it helps to keep our children away from the malls and close to our homes. The local businesses create jobs for our children, mothers, fathers and grandparents. So support your local businesses, they are not only vital to your property values, they are vital to creating happy memories." The pride she has in the town translates to the care she has for her customers. "Growing up in Hasbrouck Heights," said Mary Ellen, "the town is like my family. We want to be able to point our customers in the right direction. A lot of people have lived in town for awhile and want to move up to a bigger home." The first way the Courtneys wanted to provide this service was building a new building that would be welcoming. Their new building is well landscaped and inviting. "We wanted to add to the community," Mary Ellen added. One of the keys to the success of Gateway Realtors is their agents. "The agents that work here are part of the community and have roots in the town. We also have agents from surrounding towns and this provides a team effort when selling a house. We have a lot of pride when selling a home and we like to provide a human touch to the business," Mary Ellen stressed. They also continue to back their agents with expert training, in-depth support and excellent technology, so that they can focus on what they do best: providing excellent service and guidance to their clients. With in-house mortgage representatives, and a relocation department, to a vast network of professional services throughout the area, to 24 hour availability with www.gatewaytohomes.com, Gateway Realtors is an excellent resource in the Bergen County real estate market."